It’s not uncommon for games to try to involve the player in some kind of fourth-wall breaking way. Characters gaze up and out of the screen at godlike figures that control their world. There’s sometimes an awareness that a higher power–the player–is involved in the machinations of destiny, and because of our own connection to the story, we feel more invested and immersed than if it were something we were simply observing. 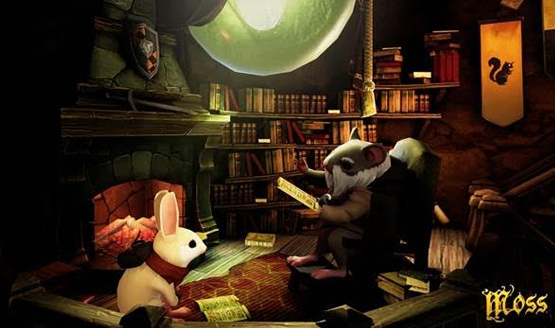 Moss is a grand adventure for the smallest of heroes–a mouse named Quill–guided by the power of the player, known in Moss’s world as The Reader. At a glance, one might classify Moss as a third-person VR game with the player’s head acting as the camera, and at a glance, you’d be right. Look closer, quite literally at your own reflection, and it’s easy to see that Moss is actually played in first-person. The Reader is an important character–the player character. I may have had direct control over Quill’s actions, but it never felt like I was supposed to be Quill. Our relationship and bond was symbiotic. I was an observer, one that lent a helping hand and a friendly push to get her where she needed to go. As The Reader, I guided Quill’s journey rather than became her. That’s an important distinction, and I don’t think Moss would have resonated quite the same had that external bond not been formed. Regularly Quill looked up at me, aware of my looming presence. Sometimes she would use sign language to communicate with me, expressions of love and thanks. Other times, after solving a tough puzzle, she’d raise her tiny little mouse paw into the air so that I could give her a high-five with the controller. She was aware of my help, and happy to have it. We became friends. I was sad to see her scared or hurt, and was elated to see her succeed, even though it was me actually controlling her actions. Quill’s adventure begins when she finds a mysterious piece of glass that connects her to The Reader, allowing the player to enter the page and become more than just an observer to the story. Her uncle, fearful of a dark force at work, runs off. Quill must follow after him with the help of The Reader to fulfill her destiny and defeat the evil that lurks beyond. The tale is an endearing one. Quill has a cute and carefree demeanor that reminds me of Frodo as he set out from the Shire in The Lord of the Rings. She’s not quite sure what dark powers she’s become involved with, but her resolute innocence will see her through to the end. I suppose that makes me a sort of Gandalf then, nudging Quill out the door on her unexpected journey. The adorably tiny mouse village soon fades away as Quill treks through swamp lands filled with the empty armor of long-dead human warriors. I love how virtual reality can change the scale of a story. A miniature world with a mouse at its center can seem massive from the right perspective. Varied environments help keep each new scene fresh. As The Reader, I don’t actually move from point to point. When Quill enters a new area, the screen fades to black and the sound of a page turning can be heard. When vision returns I am positioned in the new area, though looking towards where Quill just came from I can still see the environment stretching on. Moss never feels segmented by the distinct gameplay sections. Polyarc has done an amazing job at making this feel like one cohesive world. Moss only segments when the reader is pulled back out of the world and to the Moss book as certain “cutscenes” play out. A single narrator reads the story, providing voices for each character much like an audio book. Her reading lends a mystical sort of childlike quality to the game, but these moments of being pulled back to the library weakened the bond I felt with Quill and her world. It just became a story to me. The library does have progress markers for collectibles, so it was fun to pop out every once in a while to see these, but I would have preferred the library and book just be the menu screens, to avoid pulling me away from my direct involvement in the adventure. Each new area presents new puzzles to overcome. Sometimes Quill just needs to jump across platforms or defeat some enemies, and other times, I as The Reader needed to step in to assist with moving a large object. It was moments like these that Quill would look towards me and show signs of affection or request a high-five, and it was moments like these that I as the player felt connected to this story, world, and character more than any other game. It wasn’t my story. It wasn’t my journey. But I was being invited along and welcomed as a companion on the adventure. None of the puzzles are overly difficult. In fact, most of them trend on the simpler side of things, though there were a couple tricky headscratchers that I was excited to finally figure out. A couple of encounters felt like overly long tests of combat, with very little platforming or Reader interaction in between the swings of the sword. Fighting isn’t Moss’s main focus, so a brawl with a bunch of mechanical bugs was a far less enticing portion than those where I had to use those same types of bugs in solving various puzzles. 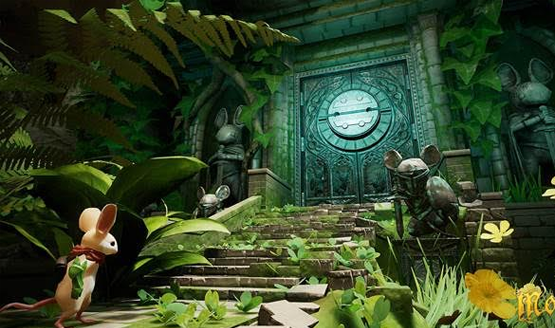 Moss’s gameplay is at its best when is involves multi-layer puzzles in an area, or shirks its traditionally linear direction for a couple of areas that present multiple paths and objectives. 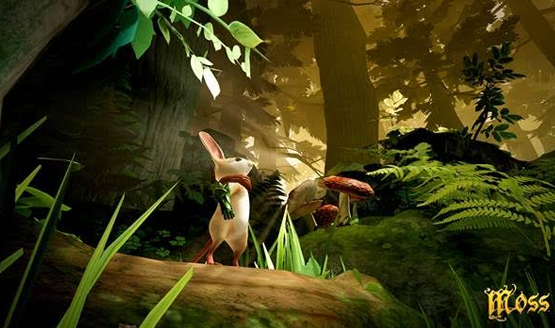 Moss is built so that even those more game-like aspects feel like important moments of bonding and cooperation with Quill. Most of the game can be effectively played by sitting in one place and simply turning your head from side to side, but I’d implore you to stand up, look around, and lean into the environments. Paths to cleverly hidden collectibles are often revealed through different perspectives, and the world of Moss becomes a vibrant and living diorama if you’re willing to move a little bit more. Moss is graphically one of the cleanest and most polished PSVR games I’ve played. The world around me felt alive, even as I was focused on the small area that Quill was traversing. Quill’s animations breath a believable life into her character, deftly balancing between mouse and human. Her subtle emotiveness is what helps to sell that connection between us, with me as The Reader. At under three hours, my bond with Quill was broken far too soon, though the end hints that Polyarc isn’t done with Moss just yet. Whether that means DLC added in to this game or full sequels, I’d just be happy for more Moss. If you’re concerned about the short run-time, don’t judge a game strictly on its length. I would take my three hour adventure with Quill over a mediocre ten hour game any day. Each moment with my little mouse friend was incredible and I was compelled to leave the headset on until the credits appeared on the page. Moss will now be my default title for showing friends and family what virtual reality is capable of. There’s a mild amount of replayability for trophies and collectibles, including the tough task of playing the entire game without letting Quill die. A couple of tricky jumps late in the game are sure to make Moss a frustrating Platinum. Moss bridges the gap between observation and participation. It creates a bond between the player and Quill, making you a part of her story. There’s a sense of pride and accomplishment for everything Quill does, not because you are her, but because you are her friend. 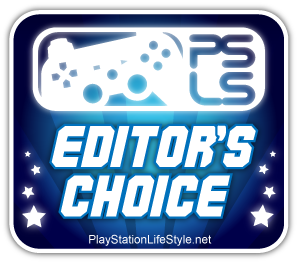 Polyarc has built an amazing adventure with a grand sense of scale, bonding players with the smallest hero as they send her out beyond the safe walls of her tiny mouse village. Even if it ends too soon, Moss is one of the most memorable and immersive VR adventures I’ve ever been on, but more importantly, it’s the best friendship I’ve ever had with a VR mouse. Moss review code provided by developer. Version 1.03 reviewed on a standard PS4. For more information on scoring, please read our Review Policy.